It would really help if instead of just going over the pronunciation of a word, they also supplied you with a definition and perhaps common usage of that word. Then you would know more than just "what this word sounds like" when you're beginning a lesson. "Translate this sentence" "mmmmk, tell me what the answer is and I'll write it back to you." The translation strictness is annoying, but hopefully that will be dealt with eventually. You can't ignore all the reports forever, right? I think there should also be a module on radicals so that people can use clues in the character to help remember the words. Edit: Actually seems like there's been changes to my Chinese course since I made this post. Lessons are a lot longer now, and seem to have more exercises with more of those picture exercises that pretty much tell you the meaning. Still lots of translation pickiness, but it looks like they're still actively making changes, which is good. Edit2: New issues with Chinese. It seems like recently the lessons have started gaining some duplicate questions. I know you get a question repeated to you if you answer it incorrectly the first time. What I'm seeing is repeat questions regardless. I saw a ton of these in the Location 6 module. It seems like all 3 lessons have duplicate questions with some questions being asked up to 3 times within the same lesson even though I answer it correctly every time. The accent marks need to be checked as well. Sometimes I only get an answer right because I went with the sound and not with the pinyin. Other times the sound is a completely different word, and I went with the character and answered it correctly. I agree, somebody needs to go through the Chinese quizzes and correct the mistakes. Yeah, I agree. Some of the difficulty here is that some words have different accent marks when they're used alone, and when they're used in conjunction with other words. It gets harder to differentiate when you're observing conditional accents, or when it's just incorrect. These rules aren't normally reflected in pinyin. There's a lot of cases where an individual word in the pinyin to character matching exercises will be pronounced differently from the pinyin. Yeah there are and it's reaaaalllly not an okay type of error to have at any frequency in a language program. Imagine if you're learning animals in English, and instead of "dog" it says (or reads) "dig". The course contributors have posted here and said this isn't something in their control. It's up to the actual course makers to fix it. I think of it more like the word "read." Let's say they tell you it's pronounced like the word "reed." You accept that. Then all of a sudden you hear audio of the word "red." What. They don't tell you it can be pronounced multiple ways. They just throw multiple things at you and don't explain what's going on. Edit: Looks like replies can only go so deep, so I'll reply to the replies here. I haven't seen as many outright incorrect entries. Just incorrect pronunciations on single words that have multiple pronunciations. Sports 2 lesson 2 has some good examples of what I mean. But are these errant pronunciation issues actually happening in whole sentences or just when it's an out-of-context character? Actually, from what has been discussed here previously, it's generally when there's a character that has multiple possible pronunciations. And then, for instance, you'll see the character by itself and it'll have the sound attached to that character that it might only have in that one specific word that happens to be taught in the lesson. And then it's basically 50/50 on which pinyin you'll see. Thanks. I knew that was a huge problem in the Japanese course but don't know that I've come across it in Chinese as yet. Sports 2 lesson 2 has multiple infractions of this kind. If you're using Firefox, try the perapera plug-in. Looks like they have it for Chrome too. I'll definitely give that a go. Thanks! RobinCard's Chrome Extension is fantastic. This is perfect! I'm not sure why they didn't just put this directly into the lessons. With these two extensions, I pretty much have all I'm looking for. Edit: Actually, the duolingo extension isn't working properly for me. It shrinks the character if I toggle show meanings on, but doesn't actually give me a meaning. Strange. Edit2: Since it wasn't working for me, and was making my duolingo lag a bit (some of that was probably also perapera, I got rid of the duolingo extension. I agree with Tim, and in fact I also use a hover tool to get the meaning of new words or characters when I am using the laptop. When I use the hand held I keep flipping over to a dictionary to get the meaning and stroke order to help me learn new characters. yea the way the teach the language is interesting. not as good as the other languages. i don't know about you, but i have had times where it says " write this in chinese" and it has the characters beneath, but sometimes they are not the right characters. Remember to include a screenshot showing the word bank and the sentence to be translated. Something i'd really like is translation of the character. adding a sort of dictionary with the vocabulary we encountered could also be a great idea in my opinion. Yeah, I understand what you're saying, and I have the same problem, I was just trying to practice my Chinese, so i already know a decent amount (I would say) of Chinese, but when I tried translating it like I USUALLY do- the way it's supposed to be translated, i sometimes get it wrong. There are multiple ways to translate languages like that, and it fells as if I have to figure out what they want me to say, otherwise, they'd say I got it wrong. As I've mentioned in a number of other threads around here, I sincerely disagree, even though I understand your frustration. To give the "meanings" of Chinese words in English is ultimately misleading: Chinese words have Chinese meanings, not English meanings. You can learn them through understanding how Chinese words are used in context. This ironically is just like the "Chinese Room" that philosopher John Searle proposed, imagining a man in a room that had a correspondence dictionary where someone pushed a chinese character under the door, and he would look up the character, write an english word that coresponded to it, and then push it back out under the door. It would appear that he was "translating" Chinese, but he wouldn't actually be able to speak the language. And indeed, much nuance is lost. If we take simple answers that dictionaries provide at face value, Chinese can become bewildering. For example "下“ is translated as the adjective "under" but it could also be a verb, an adverb, or a even a noun. Why? Because 下 is 下, and under is under. They aren't the same. 老外 have a good bit of fun laughing at "Chinglish" where someone in China just used a dictionary to translate a Chinese phrase into English, one character at a time. But when they go to learn Chinese, they make the exact same mistake, trying to learn correspondences to translate, rather than learning the language as a synthetic network of interrelated symbols. When I was just starting out learning Chinese, I learned by memorizing correspondences - matching characters to pinyin, and pinyin to English, but I hit a wall. I couldn't actually express myself in Chinese. I couldn't think in Chinese. I had to go back and relearn Chinese in Chinese, without English, in order to actually become fluent. Doing that from the beginning might be frustrating and bewildering, but it pays off big time later on. OK but in this case, it would be great having a "drawing" exercise ! So that we could learn the order and number of the strokes !!! That, I think, would be a great addition, but I think it would require significant modifications of the duolingo environment, and while maybe that could happen eventually, right now they seem to have their hands full just getting all the possible correct answers up to date. I suspect this will be a long process. For what it is worth, if you look carefully at the characters, you will for the most part be able to see the number of strokes, because each stroke ends in either a hook or a flourish. The one exception in the font that my computer and phone displays is that for the element 口 understand that it is a three stroke character, with a vertical line, a line that moves from the top towards the right then hooks down, and then a horizontal stroke at the bottom to close the box. In general, the order of strokes goes from top to bottom and left to right. Strokes that surround the character come first, while strokes that are contained within other strokes come later. You will find that more complex characters are often made up of assemblies of simpler characters. For example 国 is the character 玉 within a 口. Learning to write these basic characters and recognize them in complex ones will make writing much easier. Many characters also involve a two part assembly of characters, using two "radicals." The radical on the left usually hints at the meaning, while the radical on the right hints at the pronunciation. For example, the character 青 is pronounced "qing." However, there are several other characters that use it as a radical. For example 请 is the speech radical (言） plus 青, and it is pronounced "qing" and means "please" as in a request you make with speech. Meanwhile 清 combines the water radical (水) with 青. It is also pronounced qing, but means a clear, clean, blue color, evocative of water. This way you can break down characters into more recognizable parts. In reality, stroke order must be very precise for computer input where you draw on a softpad, but in individual handwriting in Chinese, the stroke order can vary from person to person, within certain parameters, and you will find that the stroke order changes from printing to cursive. So don't loose too much sleep over it. You do understand this is just how Duolingo works in every language it teaches, right? The first time you obviously have to check the hints (that's why new words are highlighted in a different color). But after the first time, you gradually, with much practice, come to remember them. And Duolingo's actually keeping track of whether you need to use the hints so it can show you the words you still need to learn more often. As to the first paragraph, well, there are three other threads about the same complaint still visible at the top of the forum. 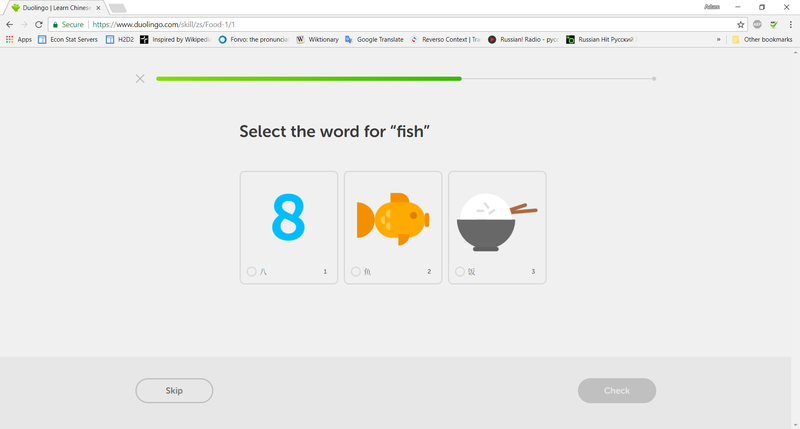 Just because this is the way duolingo works, does not make it a good method for teaching every language. Accepting things as they way it works, it how you improve nothing. My discussion view is just ordered by popular, so I don't see these other posts you're talking about, but thanks for pointing that out. It's actually entirely unclear to me why the the hover-to-learn-new-words method is any less adequate for Chinese than for any other language. I have my quibbles with Duolingo Chinese, no doubt about it. But that is most certainly not one of them. In general the way sentences are taught is probably what I like most about the course, because it's what makes it recognizably a Duolingo course. And the Duolingo set-up I have found extremely appealing and helpful from the moment I signed up. Obviously I'm far from alone in liking the set-up given the success of the site. Concretely, could they include some matching exercises between Chinese words, expressed in characters and/or pinyin, and English words? Sure. Such things exist on the app for many languages. Many people don't tend to like them much, because words don't have one-to-one equivalents between languages (and because such exercises are often annoyingly easy). That's part of the appeal of whole sentences. At least you see how the words are used. You just have to click the link to go to the Chinese forum. I don't Chinese is unique in being languages ill suited to Duolingo's tried model for language education. I imagine languages that aren't Latin based or that don't use a standard western are all more difficult to learn by the standard Duolingo model, but I haven't tried Japanese or Korean yet. If you like the model because it feels recognizable, that's great. As someone who hasn't used Duolingo as extensively as you, I'm saying it feels incomplete. I would think your distinction is really between ideographic and alphabetic languages? Otherwise not really sure how Korean differs from Greek or Russian. Although it's less familiar-looking, I understand a basic grasp of hangul isn't a time-consuming thing to obtain. Obviously things like this don't work for grammatical function words, but those are only generally translatable as part of a sentence, anyway. Good point! Russian and Greek should also be added to the group of languages that would be assisted in this way. I think those exercises would be helpful, but probably overly simplistic and could be improved upon with just a text explanation. I'm looking for something like what the duolingo browser client extension offers. Seems like a great extension, although it doesn't seem to be working properly for me for some reason. But Greek and Russian work just like Spanish does. As long as one knows the alphabet (which is the first thing one logically learns), then really the distinctions aren't terribly significant. At least they're related to English, unlike Hungarian or Swahili, two languages that use the Latin alphabet. If you said you just don't like the way Duolingo introduces new words, even for Spanish, then I think I would understand your point. Do you think Duolingo aspires to be a language practice website? I don't think "Duolingo isn't trying to actually teach you the whole language" is a good defense. Yes to this comment. Amen! They recently accepted one of my translation suggestions, so they are actively working on it I'd bet. The problem with Chinese and other non-alphabetic languages is that the way to type is different than English. The more widespread way is using romanization (pinyin) as a gloss to be able to read and write Chinese characters using letters. I've only recently started Duo but it looks like none of the lessons include typing pinyin or anything to write characters, maybe because of the difficulty of learning it? Also, to add on to your "mmmmk, tell me the answer is and I'll write it back to you. ", you are totally right about how it's not good for learning! Recognition is the first level, but being able to produce or discriminate the correct character is the ideal outcome! I suppose picking words out is discrimination, but still all the words are given to you.. lol. I didn't even notice that I forgot a "what" in that sentence you quoted. Added that. I think there's been some good discussion here, and there can definitely be improvements. It's definitely not all bad though. Duolingo is still great practice, but I think learning Chinese definitely requires some outside instruction too. I totally agree, i can manage to understand since i had classes but if someone tries to start and see some 汉字 and its prononciation without the meaning of it,they might be.....lost, I guess. What I need is to be able to say simple phrases in Chinese not learn the characters. Using pinyin would be much better. The lessons make you plod through screens of characters which will never be used before you learn the definition of the word. Your goal is a reasonable one; however, it is not the goal that Duolingo is constituted to target. I suspect you'll find your needs better accommodated with a phrasebook, and there are other platforms much, much more oriented toward giving you the phrases immediately useful for e.g. travel. I'd head to your local library and see what they have for Chinese. Yes, so my 1st language is Chinese though I am starting to lack it but I can still speak. I have been using Duolingo to hopefully teach me how to write as I can speak Mandarin fluently. While it doesn't do that it has helped me learn more words. I also agree with everybody about the strictness such as when it says brother in Chinese it makes you translate to little/older brother in English or even when it makes you choose to type her/his when translated you can just use "ta" which is basically saying that person. Reminder: Chinese is still in beta. It's actually not. However, exiting beta is an arbitrary cutoff. There are still big differences between courses that are just out of beta and those that are long out of beta.